Picture the scene. You're on a self-supported tour and happen across a single power socket in a ferry terminal waiting room. What will you choose to charge for the next hour? 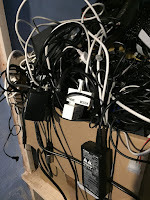 I'm sure that ours can't be the only household now with a box, cupboard or 'man drawer' full of assorted cables, many of them proprietary, a good few probably bespoke to pieces of long-since-obsolete technology, in a tangled PVC-and-cheap-Chinese-copper mess. For years, we had a plethora of different connectors and currents used for charging different brands of electronic device. Throw in having a toddler who loves nothing more than to chew on the end of a cable or two (Rhoda loves Lightning leads, but can't eat a whole one) and charging things becomes a right old nuisance, before you even leave home. Things have at least been simplified somewhat since the advent of USB, which seems now to have lasted much longer than most of the other connectors. On tour we are now carrying USB headlights on our bikes, USB tail lights on the trailer, a USB GoPro charger, an iPad mini, two or three Kindle paperwhites, and three iPhones. On top of that, there's the battery packs we use when we're 'off the grid', which also charge via a 2A USB supply. That's four on Lightning, six on Mini USB and three on Micro USB, and if Katie has to take her work Blackberry with her (heaven forbid!) that's another Micro, although if you can't make a Kindle Paperwhite last a fortnight on a bike tour, you're not doing the cycling right. 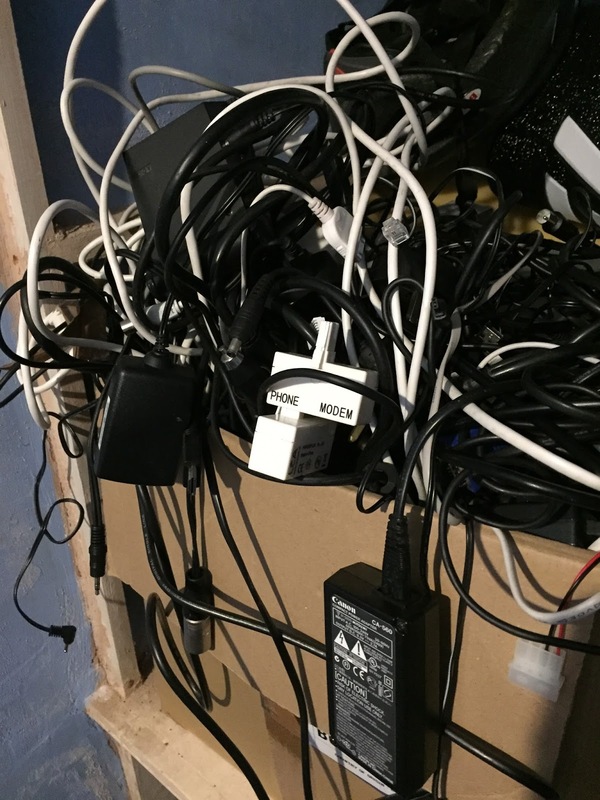 Replacing the previous plethora of unique leads, we now have the world and his wife's take on the 'Plug for the mains socket that creates a USB output for our product' bit. Some really don't like being plugged in adjacent to anything else, they can have vastly different current outputs; the 'Universal' bit has become anything but! Packing for a touring trip, especially to a country using different plugs to ours, has tended therefore to include having to work out the best permutation of plugs for the tasks required. They become the sort of 'bogey item' that serves to fill your panniers by stealth, in terms of weight and cube. Being pointy and not tessellating makes it worse! 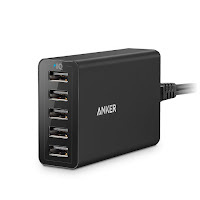 It was as I was looking for another battery pack for our trip to Brittany in the summer that I discovered a stroke of genius, in the form of the Anker Powerport 5, which by the power of Amazon Prime showed up the night before we left. It worked a treat. iPhone, iPad, two GoPro batteries and a pair of 20,000Ah battery packs. One socket! At the time of writing, you give Amazon £18 (the penny's price rhetoric) and they give you a five outlet USB charger, which automatically tailors the output of each port to the device it is charging, so you can plug a USB lead for anything into it and charge it as fast as the device can handle. The unit is capable of supplying up to 2.4A to any single port, up to a total of 8A across all five. With the right USB lead, everything is catered for - indeed, you can also use it to charge your USB battery pack whilst topping off the devices themselves. Doing all this with one mains plug makes it much easier to take advantage of mains electricity wherever you find it on your travels - on public transport, in hostels and private homes, eateries... You only need one socket and you're in business, still only drawing 1.1A from the mains. 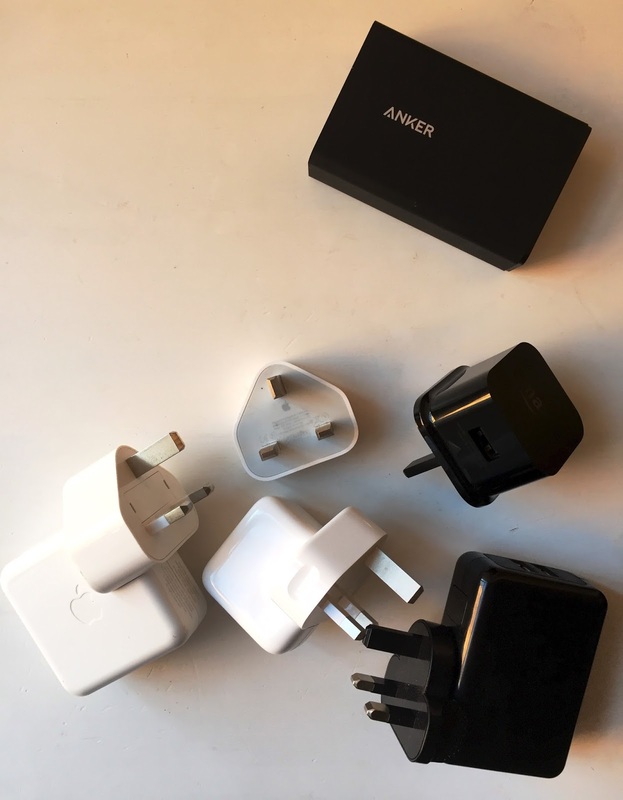 Not only is the PowerPort 5 efficient to use, but in replacing multiple plugs it takes up less space and potentially weight in your bag, and if you're going abroad, one plug means far fewer mains convertors you'll need, too. In our case we took a Continental 'Figure of 8' C7 lead with us to France, which was very handy. The PowerPoint weighs in at 255g with a UK mains lead, but is much, much easier to pack. If you are going to need socket adaptors, the savings are naturally much greater. 'Do you mind if I plug in my charger' is a lot more likely to be a successful request than 'Do you have five sockets I might use, please?'. Being able to charge multiple devices quickly and without fuss dramatically increases the prospects of success. Fewer items to carry, easier to pack, the prospect of cube and a little weight saved, it 'just works', and the Anker build quality is supported by a decent warranty and Amazon's customer reviews for the product are very strong indeed. We have no connection with Anker other than as satisfied purchasers of this and other products; the first thing we did when we got back from France was to order a second one. Highly recommended.